Spring is almost here and that means it’s almost time to start digging in your garden! Gardening is an uber-hobby. That means it can combine elements of other hobbies: art, DIY, decor, cooking, and upcycling. 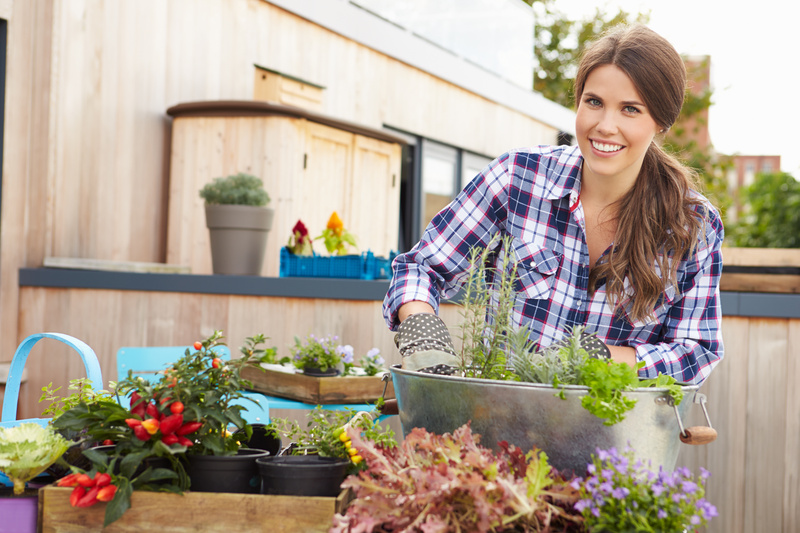 While we know lots of ways to make our lives easier and less expensive by upcycling and repurposing unwanted items, upcycling in the garden makes your yard one-of-a-kind. 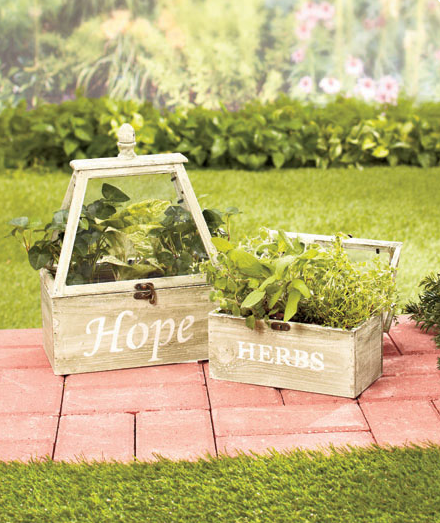 Here are 5 garden upcycling ideas to get you excited to dig. Dangling Delight Bring your garden up to eye-level with hanging container gardens! An old birdcage or a hat that’s too pretty to pitch in the garbage can be hung with a simple hook to suspend draping flowers like geraniums or fuchsia. On your porch or deck it gives your outdoor decor a little color and a lot of character. While hanging plants look great, you may want to keep your watering can at the ready — they tend to dry out a bit quicker than plants in regular containers because they’re more exposed to air. Terrarium Training Curating a terrarium is a good starter container garden. 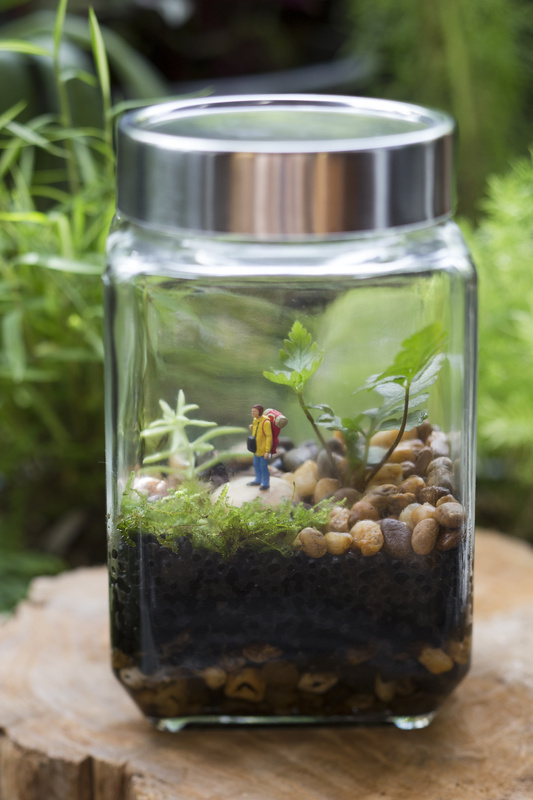 Glass containers are easy to come by to create cute terrariums if you’re not quite ready to build a full container garden. Indoors or outdoors, old vases, pickle jars or pitchers can hold the layers of charcoal, sand and soil as a base for tiny trees, ferns and grass. Terrariums require minimal maintenance, it’s just a matter or trimming and watering to keep them green. Tried & True Tomatoes The container garden-friendly tomato makes a practical plant for the decorative garden. They work best in larger containers — hanging from an old bucket or watering can, they can draw eyes up rather than to the ground to keep your outdoor decor lively and interesting. Just remember tomato plants require soil with a lot of nutrients to make your tomatoes flavorful and juicy. They also need full sun for a majority of the day, so a hanging container that you can move with the sun is an excellent way to add fresh ingredients to your summer salads. Flower Flow Flowers can dress up just about any kind of container — even an ugly old shoe! Take inventory of the containers that are still useful but might be too worn to be used for their aesthetic value. An old suitcase that might be too heavy to travel with, an old desk drawer (or an old desk! ), or a child’s wagon can be quite beautiful with the right flowers flowing from their openings. Look for colorful flowers that tend to sprawl like calibrachoa to bring your old but cherished items back to life with elegant overgrowth. Simple Seasonings Herb gardens are probably the easiest gardens to build using repurposed items around the house. They can be big displays using wooden pallets or they can be small enough to fit inside your kitchen. They’re good for small containers because their roots don’t spread the way the roots for tomato plants or carrots do. Use mason jars, tea tins, mismatched coffee cups, or coffee cans. With a good combination of potting soil, compost, and sand (or perlite) and your herbs should thrive indoors. For an outdoor herb garden, think a little bigger. You can use wooden wine boxes carefully stacked at different angles to create a small vertical herb garden or you can use an over-the-door organizers to cover a blank wall and give it a little color and a lot of life! 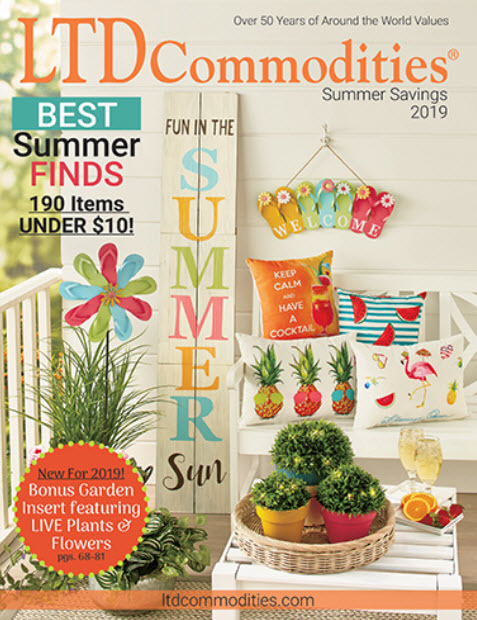 LTD Commodities has hundreds of items to get your home ready for spring — indoors and outdoors! Whether you’re curating and indoor container garden for your kitchen window or you’re dressing up your walkway, look to LTD for a happy garden!